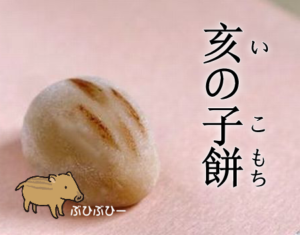 and inoko 亥の子 / イノコ / 亥子　the "young wild boar" . Yamanokami is also venerated as ミサキさん Misaki san in some regions, especially in Okayama.
. Prince Yamatotakeru 日本武尊 Yamato Takeru . but he missed the shot. He was cursed however and died that night. Shimokobe Soshi Yukihira was a famous archer who taught archery to shogun Minamoto no Yoriie in 1189. He was a descendent of Fujiwara no Hidezato, a famous archer of the Heian period. The fortification at Koga may date to the late Heian period or early Kamakura period, and the Azuma Kagami refers to a fortification in Koga built by Shimokobe Yukihira before 1180, although it is not certain if it was in this location. ... 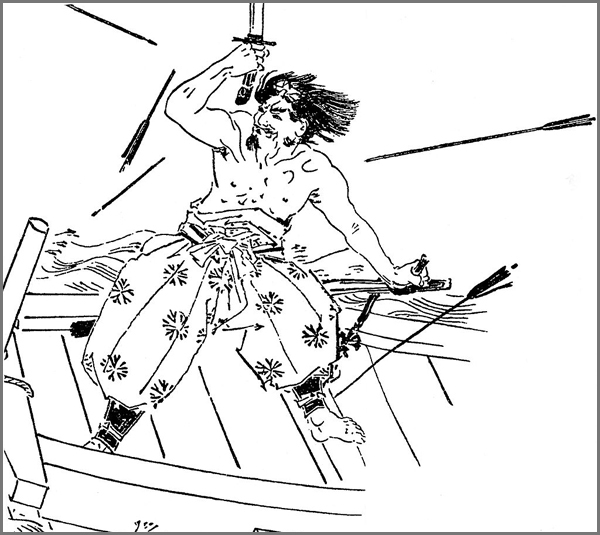 He reputedly had tremendous martial skill, particularly with the bow, demonstrating his skill frequently in yabusame archery, yumi-hajime (弓始) and deer-hunting. He later taught archery to Minamoto no Yoriie. A member of the Konishi family had killed an Inoshishi and was cursed by Yamanokami. They had killed an Inoshishi which had destroyed the rice fields in Autumn, dug a shishiana 猪穴 hole to throw in the dead body of a wild boar and were thus cursed. shishi misaki シシミサキ "Wild Boar Misaki Deity"
In 城辺町僧都 Tanabe Sozu there is a place called Shishi Misaki. During the siege of Mount Heiizan in 1571, many people fled via 上岡 Kamioka. A soozu 僧都 high priest prayed and let them flee when a group of wild boar hunters came by. But a child cried and they were arrested and killed. The priest and the wild boar had been an incarnation of Yamanokami and so the people now call this event Shishi Misaki.
. Hoshinomiya Jinja 星宮神社 . On January 9, 1900, a hunter went hunting for Inoshishi. He had forgotten that this was 山神祭 the day of the festival for Yamagami. When he rested at a spot where wild boars usually pass, one wild boar came trotting along. He took aim and wanted to press the trigger, when suddenly the wild boar became invisible and instead 黒牛 a huge black bull, like a monster, stood there. This beast became bigger and bigger. Going crazy with fear, he fled the spot and ran home, but never recovered.
. Yamanokami Koen 「山の神」公園 Park named Yamanokami . There is a statue of a mother inoshishi イノシシ wild boar, a 妖怪 Yokai monster named Yamanokami.
. Monkey and wolf - messengers of Yamanokami . 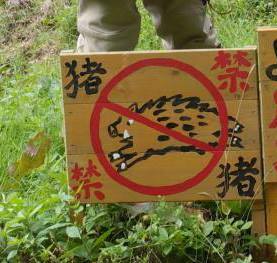 A skilfull hunter almost shot down a wild boar at 富士の裾野 the foot of Mount Fujisan. When the animal came closer, he prayed to Yamanokami to help him win this battle and said it would be the last Inoshishi. And indeed, he could shoot the animal and carry it home. He begun boasting about his "deal with Yamanokami". But then he went out hunting again and never came home. When they looked for him, they found him stuck in the snow. This was the divine punishment of Yamanokami.
. coping with Inoshishi in my mountain area . The day of the boar in the tenth lunar month. In 2017, it is the 8th of November. This month is also called inotsuki 亥の月 month of the boar. Rituals on this day are more common in Western Japan. They were prepared in the hour of the boar and eaten as a harvest thanksgiving. This a custom coming from China. 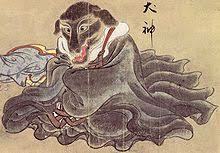 Here the deity honored is also seen as the God of the Fields (ta no kami). Many tea masters close the summer hearth on this day. Inoko is a festival on 旧暦10月の亥の日 the day of the wild boar in the tenth lunar month. 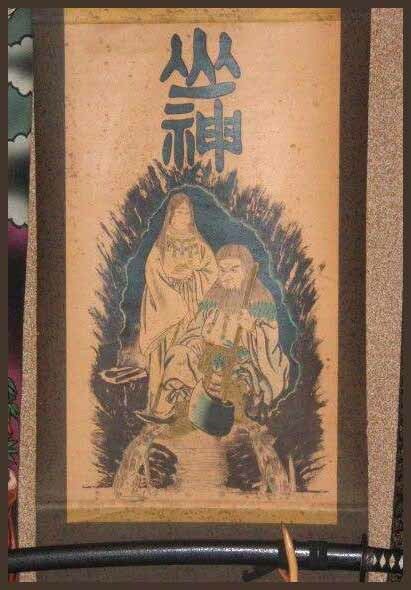 On this day 田の神 the Ta no Kami - God of the Fields goes back to the mountains. bury demon children with horns in the ground." On this day people are also not allowed to go to the fields to pick daikon 大根 large radish. They were thought to prevent illness, especially the common cold in winter and would bring many children to the family. The stone looks almost like a matsutake 松茸 mushroom. Its head has a diameter of 20 cm and the length is 40 cm. It is 11,5 kg heavy. It is decorated with colorful paper ornaments and a lot of ropes. it is carried to all the homes and hit on the floor of the entrance. inoko mochi o tsuku 亥の子餅をつく preparing Inoko mochi.
. toshitokujin 歳德神 Toshitoku Jin, God of the Year . Some legends are related to taboos concerning the daikon 大根 radish. People should not cut radish on the day of Inoko, because if someone hears the sound of cutting, he will die. Farmers are also not allowed to go into 大根畑 the radish fields to pull radishes.
. daikon 大根 radish legends . On the evening of the Inoko day, young men walk around the village to homes where a baby boy was born this year. will have a Demon child, will have a Snake child ! 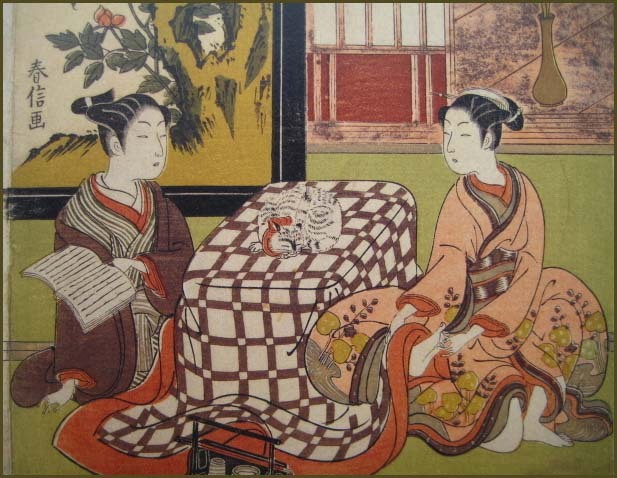 The Kotatsu heater is first used on the day of Inoko. If people celebrate Inoko, they will be blessed for one year. If people eat eggplants on this day, 風邪の神様 the Deity of common cold disease will come to stay in the house.
. kotatsu コタツ　炬燵　こたつ,　おこた　heatable table . 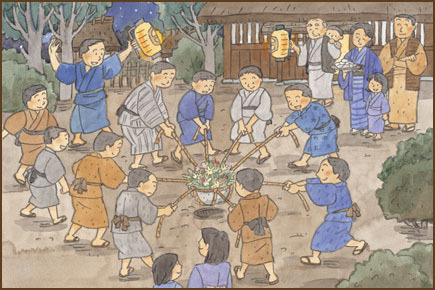 On the evening of the day of Inoko, children were walking around when someone called out to be careful of a ball of fire. It was almost blue and had a tail, passing slowly over the roofs of the village. The wolves from the hamlet 油袋 Yutai. If children bring Mochi after a birth and on the Inoko day, the wolves walk between their legs or jump over their heads as a blessing. In 三瓶町 Mikame the wolves also just follow the children. 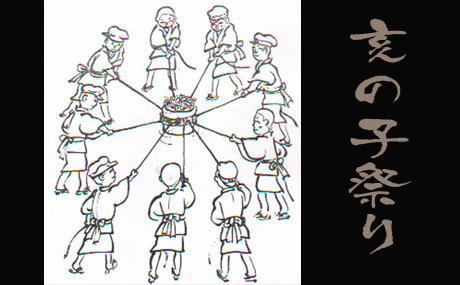 On the day of Inoko fermers pray to the deities to prevent bad luck and offer them seeds of mugi 麦 barley. If they do not do this, all their barley seeds will be lost, they will get ill and even die. On the day of Inoko, children walk past the homes and sing the Inoko song about snakes and demons. He comes on the day of Inoko, therefore people leave the door open and also the kotatsu コタツ heated table for him to come and sit in the home. soy, wheat, barley, proso millet, and foxtail millet. 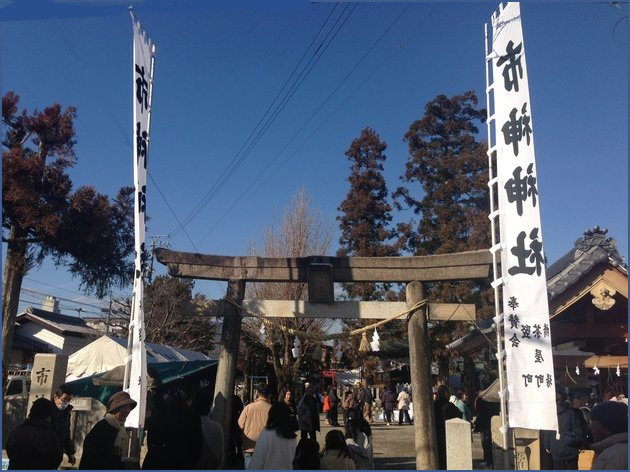 Before the war on the day of Inoko there was an exhibition of the village harvest of the year. But the foxes built a long procession with lanterns and stole all the food. The tenth lunar month (now November), after the harvest when the Japanese gods had done their duty, they left their local shrines for a bit of a vacation and went to the Izumo Shrine. On 亥の日 the day of the wild boar day in Northern Okayama, the weather usually turns bad with cold and rain. This is called - inoko are 亥の子荒れ. The nando 納戸 storeroom of a house is often used as a bedroom for the young couple and a place to give birth. In the hamlet of 富坂 Tomisaka it is customary to have a shelf in a corner of this room and put offerings for Inoko there. On another shelf san no kami 産の神 the Deity of Birth is celebrated. In such a home, the deity of the new year is also celebrated as 若年様 wakadoshisama or 年神様 toshigamisama. On the evening of this day people do not go to the radish fields . If someone hears the sound of a radish cut, he will die soon. handed down to the Kitahata-Kamihirano region of Karatsu City is held on the day of the Boar of the lunar calendar. 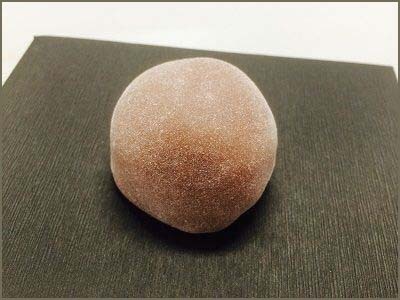 By around the end of the Meiji era, the Inoko-ishi (stone) was pounded around in each region but this tradition gradually faded and presently, in the Kamihirano region only, the event is handed down. At the time of the first Inoko, the people were glad at the birth of a boy while at the time of the second Inoko, the birth of a girl was welcomed. 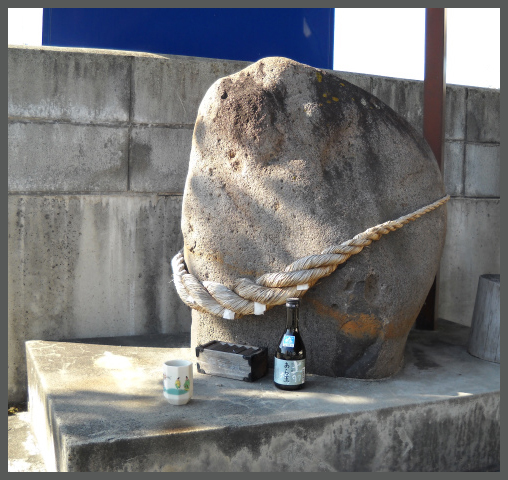 Children holding the inoko-ishi stone visit each home of the region, sing a festive song, and pound the stone. 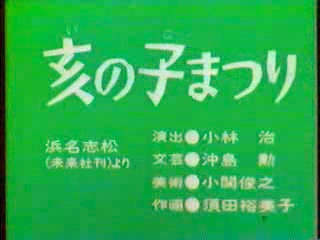 handed down in Uwaba, Chinzei-machi, Karatsu City was originally performed in order to boost the morale of the people of the region on the October day of the boar, when Toyotomi Hideyoshi dispatched troops to Korea, and the event has since been performed to date in order to celebrate the harvest. Sixty to ninety pieces of agricultural rope are twisted together to make two ropes 60 cm in diameter and 60 meters long, which are bound together at the center to form a rope with a total extended length of about 100 meters. 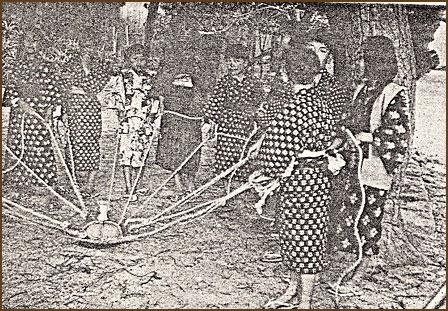 After holding divine service, the people are divided into upper and lower groups and engage in a tug of war. Presently, three tugs of war are held at the signal of fireworks. The Kotatsu heater is first used. This will protect the home from fire and disaster. moo inoko ka もう亥の子か "Is is already Inoko time?" (a pun with moo ii kai? in a children's game).
. botamochi ぼた餅 / 牡丹餅 "peony cakes . 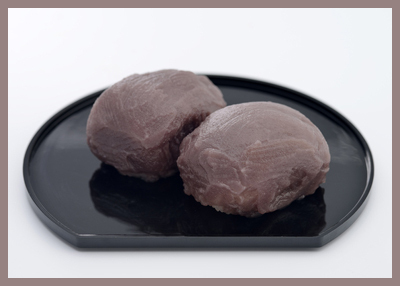 round rice cakes covered with sweet anko powder. 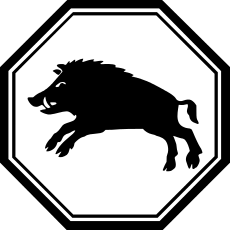 Inoko san is another name for Tanokami. 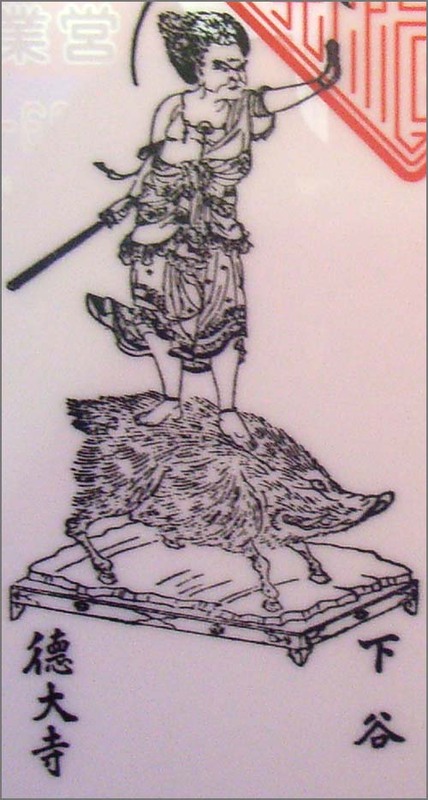 In February on 亥の日 the day of the boar it comes down from 神棚 the Shelf of the Gods in the home and goes out to the fields. On the day of the boar in the 10th lunar month, people offer fresh 餅 mochi rice cakes on the Shelf to welcome it back. The mortar for making Mochi must be washed clean and kept outside until the morning so that the "Young Wild Boar" can touch it and make sure it is his own home. There lived a mean landlord and his mean daughter. The landlord used to lend money to people. On his land there was a huge boulder, which he could not move away by himself. So he spread the word he would give his daughter as wife to anyone who would move the boulder. But, well, the daughter of the mean landlord, nobody wanted her. There came only one boar willing to do the job. The angry landlord spread another message "I give my daughter all all my riches to the one who moves the boulder!" not even the strongest man could move the boulder and in the end it was the boar who moved the boulder. The landlord had to keep his word and let the daughter go as bride with the wild boar. The happy boar put the bride on his back and gallopped back to his mountain. But as he was running, the mean daughter took a fire stone and straw, lit a fire and burned the back of the animal. Jumping in pain the boar fell from a cliff and died on the spot. This episode made the rounds in the village and all felt sorry for the boar. So they decided to have a festival for it on the Day of the Boar in October. 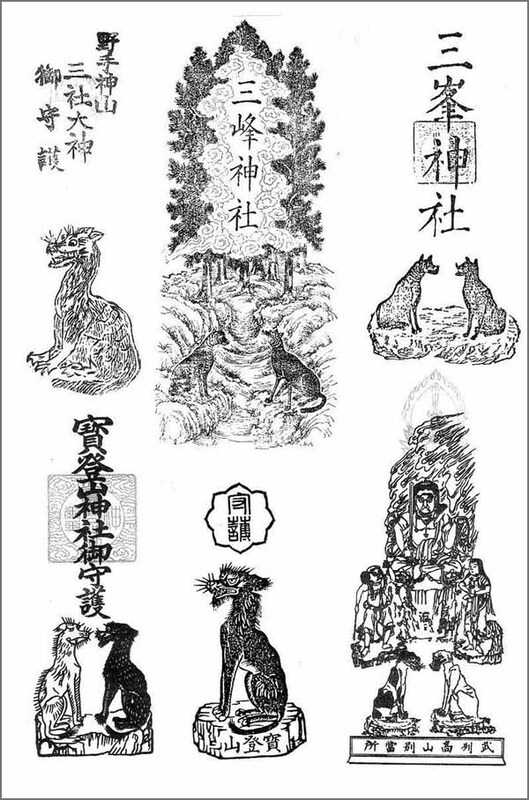 There are various shugojin 守護神 protector deities of market towns, many of then female. 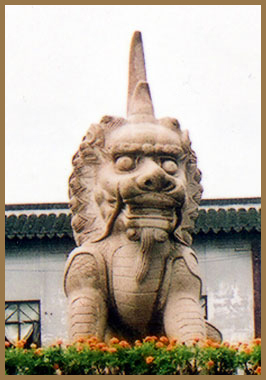 They are venerated in various forms, from natural round stones to carved stones with the inscription 市神 or six-sided wooden pillars and small 祠 Hokora shrines. They were placed at the entrance to a town or a fishing harbour, at a bridge or a four-road crossing. 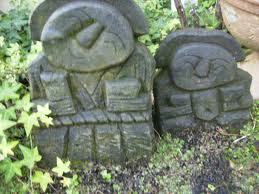 They are closely related to the Dosojin Wayside Deities.
. 道祖神 Dosojin Wayside Deities . The oldest mention of an Ichigami is in 795, when 藤原冬嗣 Fujiwara no Fuyutsugu enshrined the 宗像大神 Munakata deity as protector of the East and West Town of Kyoto. 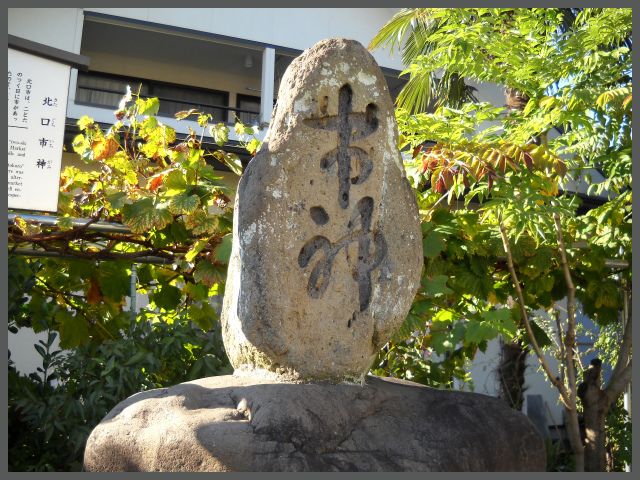 The deity in residence is 恵比寿様 Ebisu sama. With a special market on every day with a seven - 七日市 / 七日福市.
. WKD : konoshita yami 下闇（こしたやみ） darkness under the trees .
. International Shinto 国際神道　.
. Ichi no Miya, Ichinomiya 一の宮 Ichi no Miya shrines - 一ノ宮、一の宮、一之宮 .
. ichigami　市神 deity of the market town .
. Inu Jinja, Inu-jinja 犬神社 / 伊奴神社 /　イヌ神社　dog shrines .
. Isonokami Jinguu 石上神宮 - 布留大明神 Furu-ōmyojin.
. Itate Tsuwamono Jinja 射楯兵主神社 . - Kagoshima / Kamafuta Jinja 釜蓋神社 "Kamafuta Pot Lid Shrine"
. Itsukushima 厳島神社 - Tochigi, Ashikaga . - 十二神社, 十二大明神, 大山祇十二神社 .
. . . and . Yakushi Nyorai　薬師如来 Buddha of Medicine .
. Iwayaji 岩屋寺 Iwaya-Ji - Shikoku Henro 45 .
. Iyo 12 Yakushi Temples, Shikoku 伊予十二薬師霊場 .
. Jikooji 都幾山慈光寺 Jiko-Ji .
. Jingoji　神護寺 Jingo-Ji, Kyoto, Sanbi 三尾 .
.　Joofukuji 常福寺 Jofuku-Ji temples for Fudo Myo-O .
. Joofukuji 成福寺 Jofuku-Ji temples for Fudo Myo-O .
. Jooju in 成就院（たこ薬師）Temple Joju-In .
. Jooryuuji 浄竜寺 Joryu-Ji “Pure Dragon Temple” .
. ikenie　生贄 / 生け贄　human sacrifice .
. ikke ujigami 一家氏神 - ujigami　氏神 clan deities .
. imi 忌み ritual taboo and imigomori 亥巳籠 retreat .
. imiki, imi ki (imigi) 忌み木 "taboo tree" .
. ita honzon 板本尊 main deity carved on a wooden plank .
. iwakura 磐座 / 岩座 sacred rock, divine rocks, divine boulders . - - - - - iwaza 岩座 "stone seat"
. iwasaka 磐境 stone altar .
. Izanagi Ryu いざなぎ流 rituals from 物部町 Monobe, Shikoku .
. jarai じゃらい arrow shooting ritual - New Year .
. jindai moji 神代文字 “scripts of the age of the gods” .
. jinushigami　地主神　－ yashikigami　屋敷神 "estate deities" .
. Jiun Onkoo 慈雲飲光 Priest Jiun Onko (1718 – 1804/1805) .
. Jizooguruma 地蔵車 Jizoo Wheel - "100 prayers circuit" for Jizo Bosatsu .
. Juji, Jichi Bosatsu 十地菩薩 10 stages of a Bodhisattva .
. jumokuso 樹木葬　funeral and grave under trees .
. juunisama, jūni sama 十二様 Juni Sama "Honorable 12" deities .
. juuni ten 十二天 Twelve Juni Ten Deities .